The ladies have done it again. What ladies? Dayna Winters, Patricia Gardner, and Angela Kaufman of course. You may remember them from “Wicca: What’s the Real Deal?” and “Sacred Objects, Sacred Space”. Those two books were excellent, and their latest book, “The Esoteric Dream Book: Mastering the Magickal Symbolism of the Subconscious Mind” doesn’t disappoint. As I’ve come to expect, there is a tremendous amount of information in “The Esoteric Dream” and yet you never feel overwhelmed and the book comes in at a svelte 221 pages (including endnotes). For those of you thinking that 221 pages seems like an awful lot, you haven’t heard all that you’ll learn about in this offering. Let me start by telling you that this isn’t a dream dictionary, and that’s a good thing. As you’ll learn from “The Esoteric Dream Book” (because you’re going to buy it), there is so much more going on in dreams of a personal nature than a one size fits all dream dictionary can hope to cover. That’s not to say there is no space for a good quality dream dictionary in your life, I have a couple, but you need more, and this book is what you need. Now that I’ve told you what you’re not getting, you’re probably more than ready to hear what you are going to get. You’ll learn how to document and analyze your dreams. There’s a lot of discussion of symbolism, themes, and archetypes. Also how to learn to recognize these things when they pop up in your dreams. Ways to improve the quality of your dreams, including deities associated with dreams and gems for dream enhancement. The tarot archetypes, the Major Arcana primarily like The Fool or The Tower, as they appear in dreams or using them for dream work. And just more! 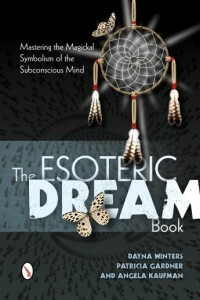 I feel “The Esoteric Dream Book” is Winters, Gardner, and Kaufman’s most complex book to date, and still the subject matter is presented in a way that is easy to understand. Anyone who is serious about learning to understand their dreams should definitely pick up this book.